Sweet Little Birdy loves to sing Happy Birthday and serve up yummy cake! 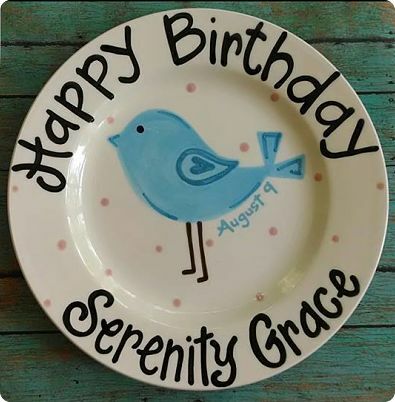 This is one of our most popular birthday plate designs thanks to custom requests from customers over the past year. Our sample shows a blue bird, but you can also request a different color of birdy if you like. Please allow 4-6 weeks for this plate to be custom painted just for you, with your choice of colors, name and add a birthdate if you like. NEED IT SOONER? Select one of our RUSH OPTIONS to get your order expedited. Standard Rush: $15 extra... your plate will be ready to ship 10 BUSINESS days after the date of paid order. (doesnt include weekends or holidays). Express Rush: $25 extra... your plate will be ready to ship 5 BUSINESS days after the date of paid order. (doesnt include weekends or holidays). This doesnt include the actual shipping travel time, please allow the post office 3-5 business days for delivery.